U.S. Ambassador to the United Nations Nikki Haley is no stranger to speaking her mind. Over the past year and a half, Haley has repeatedly, and very openly, criticized the UN for its globalist leanings and bias against the state of Israel. And when President Trump last year announced that the U.S. would be recognizing Jerusalem as the capital of Israel, Haley was defiant in the face of massive opposition in the UN General Assembly. 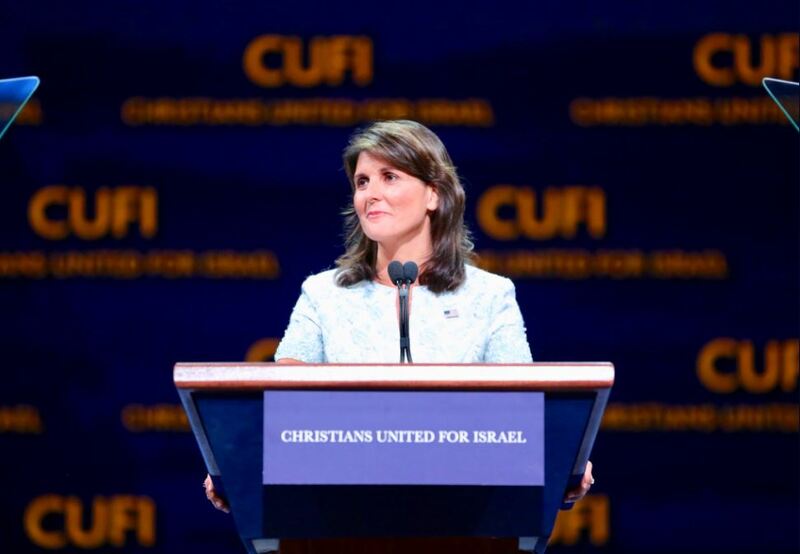 A long-time advocate of U.S.-Israeli relations, Haley addressed the Christians United for Israel Summit Monday, where she was also presented with the “Defender of Israel Award” by CUFI pastor John Hagee. “Each year the leadership of CUFI elects the one person in America that we feel has done the most to defend and protect Israel. We are delighted and highly honored to present this award to Ambassador Haley,” Pastor Hagee said as he presented her with a golden plaque. Another of Haley’s challenges to the UN came when she vetoed a resolution that fiercely condemned the actions of the Israeli army while refusing to acknowledge the violent actions of Palestinian terror group, Hamas, during a recent outbreak of violence on the border. “When I heard country after country in the United Nations Security Council critically standing in judgment of Israel, I spoke out. What I said shocked the people at the UN, but I’ll say it again because it’s the truth. Israel has acted with more restraint than just about any country would under those same conditions,” Haley explained at the summit, according to CBN News. And it appears that her pro-Israel position has begun to pay off, with many in the UN General Assembly beginning to come around on the issue of Hamas and its inhumane actions. “The idea that we could get the majority of the General Assembly for the first time to even acknowledge that Hamas was an issue is a fantastic win,” Haley noted. And as for Haley herself, will she tone down the rhetoric at any point? Well, probably not. “Being silent was never something I’ve been good at,” she laughed. Haley also gave a brief insight into her intriguing faith journey.